Buy lightweight Two-Rows-Of-Teeth Handcuff Stainless Steel Police Handcuffs at competitive prices from us! 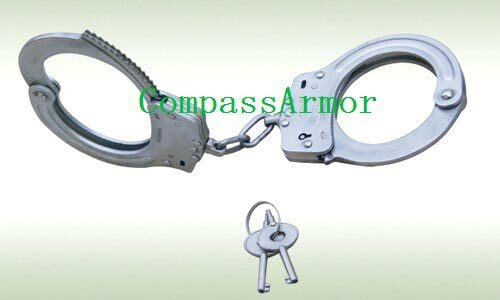 We are enlisted with the chief Manufacturers, Exporters, and Suppliers of Stainless Steel Handcuffs from China. We are a quality-endorsed organization, which abides by international standards all along the production of these handcuffs. They are made of premium stainless steel and are endowed with high strength. They are corrosion resistant and made to last long. Light weight, 2 rows of thick and strong teeth, extra security for the locking system, resist pulling by hands, made of polished steel, covered by nickel, 2 keys made of steel, 2 rings chain fixed to the cuff body through movable ring, galvanized and soft wrist, wide wrist size to be used for all hands kinds, nickel color.